Several years ago, I made a goal to read a graphic novel. It was a goal that was truly outside my comfort zone, and although the end result wasn't bad (I read Rapunzel's Revenge and Calamity Jack), I distinctly remember saying that it would never be my "go-to genre of choice." Well, I'm kind of taking back my own words. Although it's not like graphic novels are the only things I read these days, I have periods where I actually seek them out because they're just the kind of quick, entertaining read I need. It also helps that the graphic novel genre is booming right now, and there are many high-quality, realistic stories to choose from. Authors/illustrators are really thinking outside the box and using this medium to share memoirs, classics, and even history in a new way. I've been quite impressed. One of the graphic novels that has been on my list for a long time (and I think was even recommended to me when I made that goal four years ago) is Smile. I think this was one of the first "graphic novel memoirs" to be published, and Raina Telgemeier has been something of a pioneer when it comes to reinventing the genre. When Raina was in sixth grade, she tripped and knocked out her two front teeth (one was knocked out onto the sidewalk, the other was knocked up into her gums). It turned out to be a pretty serious accident with a lot of damage to the roots and her jaw. Over the next three years, she experienced ordeal after painful ordeal as various "dontists" tried to reconstruct her teeth . . . and all of this during perhaps the most vulnerable time in a person's life: junior high. 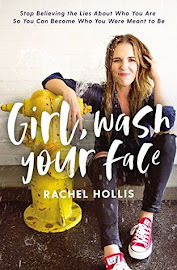 Raina relates it all with a candidness and humor that won me over from the beginning. There's one scene where she and her mom are driving home and going over all of the events of the past year. Her mom says, "It's been a pretty strange year for you, hasn't it. You knocked out your two front teeth, you got braces, you got your ears pierced." Raina adds, "I survived a major earthquake . . . " (she and her family live in San Fransisco). "I guess in the grand scheme of things . . . losing a couple of teeth isn't the end of the world!" But in spite of her positive attitude, the next panel shows an anxious frown on her face as she stares out at the falling rain. A sigh escapes her lips. It was such a perfect representation of real life: for all that you can recognize your blessings and tell yourself that "little" things aren't that significant, in reality, those day-to-day insecurities and trials really do hurt and make a lasting impact. I had this book checked out from the library for several weeks before I got around to reading it. During that time, Aaron spied it and snatched it up. He can't resist a graphic novel. I actually had no plans of letting him read it because I thought junior high was a little old for him, but he was halfway through before I even realized he had it, and by that time, it was too late. I was a little nervous about what I might find in it and have to explain to him after the fact, but it was very mild. 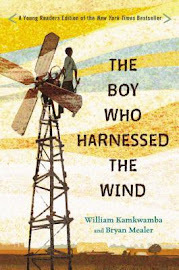 There were some brief mentions of puberty, a little boy/girl drama, and some rocky, unhealthy friendships but nothing that I felt uncomfortable with him reading. So we dodged that one. And for my part, I thought it was an absolutely fantastic story, and I'm anxious to read Raina Telgemeier's other books . . . even though graphic novels are not my "go-to genre of choice." Haha. This seems to be a favorite to win some sort of recognition at the ALA Midwinter meeting next month. At least, I've seen it on a lot of prediction lists. 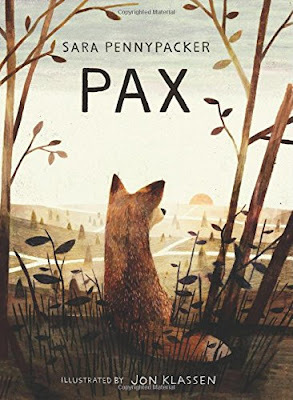 I haven't read any other novels by Sara Pennypacker (although some of you might be familiar with her Clementine series), but this one definitely seems to have a more serious lean to it than most of her other work. It's about a boy, Peter, and his fox, Pax. When the story opens, Peter and his father and the fox are driving deep into the woods. When they come to a stop, Peter throws one of Pax's favorite toys (a plastic soldier) as far as he can and then, while Pax runs off to get it, he and his father get back in the car and drive away. The reason? War is coming; Peter's father has enlisted, and so Peter is being sent to live with his grandfather, which is no place for a fox. But the decision doesn't sit well with Peter, and within a day, he has decided that he has to go back and find Pax. He just feels like it's the right thing to do. Unfortunately, he is now a couple hundred miles away from his home and not exactly well-equipped to travel such a long way, especially not after he breaks his foot just a short way into his journey. But he already abandoned Pax once, and he's not willing to let anything, not even a broken foot, abandon him again. It turns out that Peter has a lot more to prove than just his loyalty for Pax. For example, that he can be different from his father and his grandfather, that he can be where and who he needs to be, and that, most importantly, life matters. The other thing that confused me was the war itself. I actually kept going back and looking for an author's note or some other sort of explanation for this war. When I couldn't find anything, I wondered if I was just totally missing something or had completely forgotten about some war that happened on American soil fairly recently. (I don't think I would have overlooked such a thing.) At any rate, there is a war, and it's serious enough that it's causing many towns to evacuate, but it seems to be made up for the sake of the story. I can definitely see why this book is generating a lot of attention. It doesn't sidestep important issues but faces them head on in a real and authentic way, which means that it doesn't necessarily have a "happy" ending, but it is completely appropriate and satisfying. Oh, and have I let this whole review slip by without mentioning my favorite character? That would be Vola, a reclusive war veteran whose stern, no-nonsense attitude helps Peter get back on his feet and who wrestles with her own past as she helps Peter wrestle with his. The book could be read and enjoyed for Vola's character alone. She's that good. 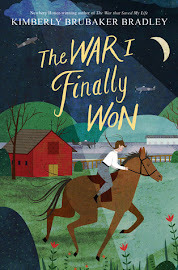 Can I just tell you that when I find gripping, well-written middle grade nonfiction I kind of feel like I've won the lottery? . . . Not that I actually know what it feels like to win the lottery, but honestly, it can't be better than this. And Amelia Lost was one of those times when I won. I think I've always had a certain fascination with Amelia Earhart (who hasn't? ), but this book took it to a whole new level. The writing is snappy and compelling without feeling overly dramatized or embellished. It's an honest, candid look at Amelia's life and the details behind what happened on her infamous around-the-world flight. I think Amelia Earhart would have been well-known regardless of what happened on that fateful flight in 1937, but the fact that she disappeared has kept her in the news even as recently as two months ago. And after reading about who she was and what her personality was like, I can't help thinking that in some ways, she would have loved the mystery and intrigue that has surrounded her life (and death) for the last eighty years. She and her husband, George Putnam, were always very aware of the publicity side of her career. They knew it was important to keep her in the spotlight if she was going to be able to continue to reach new goals, and they could both be rather ruthless and deceptive at times to make it happen. Candace Fleming wrote, "But no publicity scheme concocted by George Putnam could have enhanced Amelia's image more than her tragic accident. In life, she had been famous. But now--by vanishing--she became a legend." 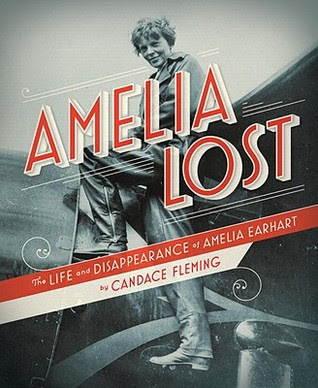 If you had asked me what I knew about Amelia Earhart before reading this book, I would have said that she was one of the first female pilots who made several historic and record-breaking flights before disappearing at sea while trying to be the first woman to circumnavigate the globe. While that information is all true, what I didn't really realize was that even though she "disappeared," it wasn't like one minute she was communicating via radio and the next she was just gone, vanishing in thin air, which is what I kind of always assumed. In actuality, she was nearing the end of her journey, coming in for her second-to-last landing on Howland Island, a tiny speck of land in the middle of the vast Pacific Ocean. She was well aware that this would be her hardest landing to make because navigation tools were so primitive in the 1930s, and she only had a short window between when she needed to find it and when she would run out of gas. There definitely were some radio signal issues which contributed to the disaster, but for several days after she failed to land on Howland Island, many people were still picking up radio communications from her. Unfortunately, they were never able to get an actual navigational bearing and so couldn't rescue her, but it's obvious that she landed somewhere and survived for who knows how long as a castaway. It's really kind of crazy. I actually read this book with Aaron, and he enjoyed it, too. I was a little concerned about some of the more mature content--Amelia's alcoholic father and George Putnam's affair with Amelia before his first wife divorced him--but it was all just addressed in such a frank, sparsely detailed way that I think it was fine for him to read. That's actually the danger of reading about real life--human beings are not perfect; they make real, heartbreaking mistakes, and I was grateful that Candace Fleming didn't put Amelia Earhart on a pedestal but looked at who she really was, weaknesses and all. She definitely didn't dwell on the mistakes, but they were there, for the reader to assess and learn from on their own. Candace Fleming has said she likes writing about the puzzle of people's lives, and that is very much what this book is. I found it absolutely brilliant. I remember reading and liking the Amelia Earhart book, which means it was probably a Cybils finalist (or winner). This year my biggest pleasant surprise was the MG non-fiction on Mary Malone, aka Typhoid Mary, which was unexpectedly gripping. I did joke that if I cleaned my house for five minutes every time the word "feces" appeared, the place would be spotless. Good luck finishing the reviews, and I look forward to your goals for next year! Yes, I think Amelia Lost won the Cybils award for YA nonfiction several years ago. I'm going to have to look into the Typhoid Mary book. I'm a sucker for well-done nonfiction! 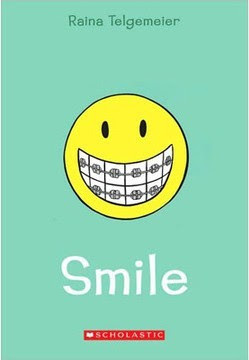 I enjoyed Smile, but I loved(!!!!) Sisters by Raina Telgameier. I found it laugh out loud funny in a couple of places. Because you grew up with sister(s? I am pretty sure you've mentioned at least one), I bet you'll enjoy it too. I remember being blown away by Amelia Lost. So interesting. Yay! I'm so glad to hear that Sisters is even better! Pax has been on my TBR since it came out. I adore her Clementine books, but there's something about Pax that makes me hesitant to start. It seems like such a dark story (and Klassen's illustrations are kind of ominous). It's still on my list, and I hope to get to it this year, but I think it's going to be one I sort of "force" myself to read. I've been interested in the Amelia Earhart book for awhile now, and I'm so glad for your positive review. How will I ever get to all these books?! Although I haven't read the Clementine books, I think Pax is VERY different. But don't be scared about it...it really does have a hopeful feel.